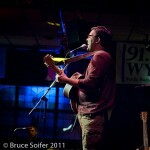 Kevin Milner is an incredibly talented singer/songwriter living in Dayton, Ohio. We first met at the Musician’s Co-Op at the Canal Street Tavern where he witnessed my first trembling, terrifying open mic experience. Kevin wrote the song Lines and Spaces, an arrangement of which I perform in my Zero tour. His band, The Half Shebang can be found performing the Dayton area, and they recently performed public radio station program Kaleidoscope.